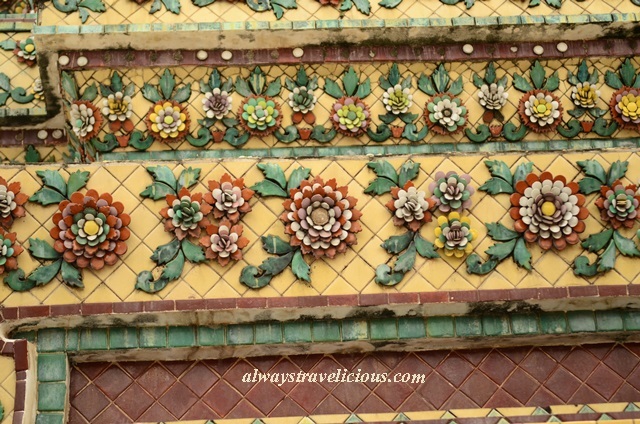 Wat Pho @ Bangkok, Thailand - Always Travelicious ! 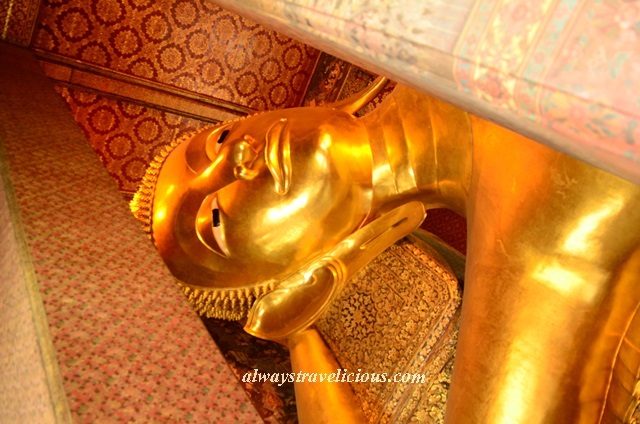 Wat Pho in Bangkok enshrines the giant golden Reclining Buddha, at 43 m long and 15 m high. The temple was originally a learning center for traditional Thai medicine, which was later expanded and the Reclining Buddha was built by King Rama I in 1767. It is really not easy to get a nice full length picture of the Buddha with many tourists around. A miniature version is place in front of the Buddha. A closer look at the Buddha’s face. The view is obstructed because of the beams. Everything about the Buddha is grand. 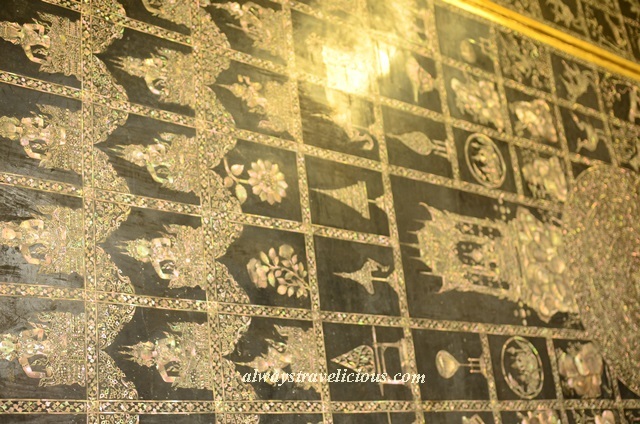 The feet alone are 4.5 m long and 3 m high with 108 panels of auspicious images made with mother-of-pearl. Naturally, the pillow that the Buddha sleeps on is enormous too. The room that houses the Buddha is decorated with religious murals. The temple is rather lively, accompanied by the percussion of coins clinking the bronze bowls. There are a 108 of bowls, and supposedly dropping a coin in every one of them will allow your wish to come true. Coin changing service is available at the temple. The Reclining Buddha is what most people come to the temple to see, but it is worth it to walk around the rest of the compound, where thousands of Buddha statues are kept, and about 90 chedis in various sizes that hold the ashes of Buddha and members of the royal family. Some of the smaller chedis. 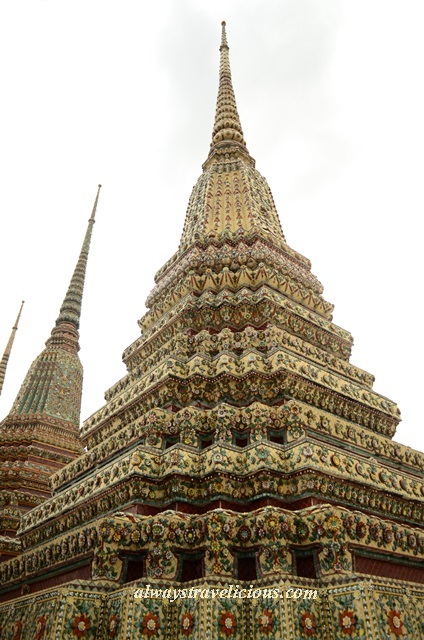 Some of the larger chedis and details. Address : 2 Sanamchai Road, Grand Palace Subdistrict, Prnakorn District, Bangkok 10200, Thailand. Admission Fee : 100 Baht (includes one bottle of mineral water). Pingback: Wat Phra Sri Sanaphet @ Ayutthaya, Thailand | Always Travelicious !